Woof, woof! 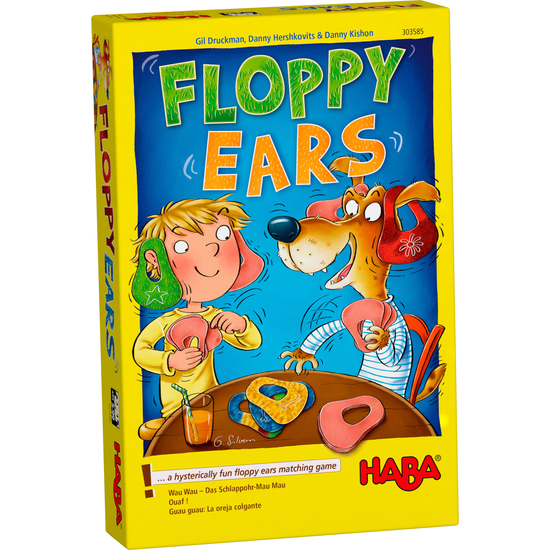 In this hilarious game, each player strives to be the first to play out all of their floppy ear cards. But beware, you must always play the cards hanging on your ears, first! Only those who can remember which floppy ear cards are hanging on which ear, and play them out at the right moment, have the chance to have World’s Best Floppy Ears! Contents: 36 sturdy floppy ears, 1 set of instructions. Short game instructions: • Shuffle all the dog ears face-down and deal five dog ears as hand cards per player. The remaining dog ears are for the face-down draw pile. • Each player chooses any two dog ears from their own hand cards. Remember the coat color and symbol of the dog ears, hang one of them on the left ear and one on the right ear so that the others can see the symbol. Keep the other 3 dog ears hidden in your hand. • Turn over the top dog ear of the draw pile. Lay down a matching dog ear (same coat color or same symbol). But watch out: The ear has priority! First lay down a dog ear from your own ear (and hang a new dog ear from your hand on the vacated ear), then from your hand. • If you lay down an incorrect dog ear or hand card, despite a matching dog ear on your ear, draw a penalty card. If you don’t have a matching dog ear, draw a dog ear from the draw pile. • The first player to lay down their last dog ear from their ear and at the same time bark “Wau Wau” wins.